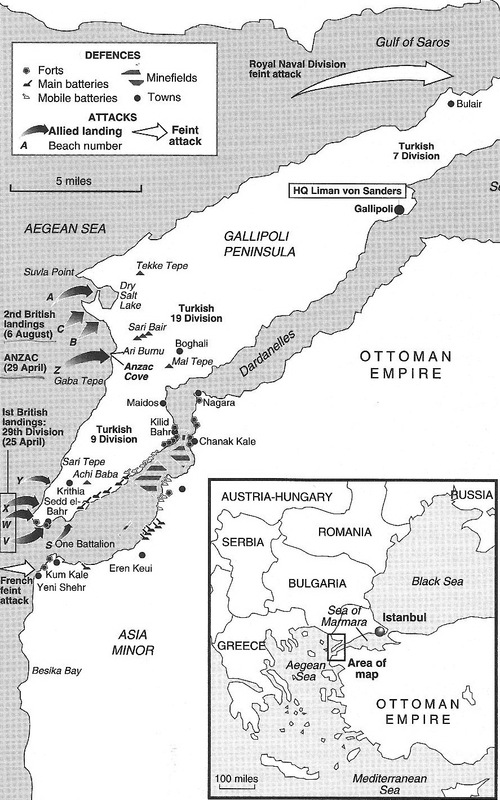 After the outbreak of war the hope of keeping Turkey neutral had prevented any attempt by Great Britain to implement a plan to force a passage through the Dardanelles, (Gallipoli), in order to gain contact with their Russian ally. Such restrictions were removed at the end of October 1914 however, when Turkey decided to throw in her lot with Germany. The British wished to break the deadlock on the Western Front by campaigning in other theatres. A proposal was put forth for an immediate large-scale combined mili­tary and naval operation against Turkey. The scheme ultimately was judged not practicable and was discarded. By late January 1915 the British War Council authorized action by the Navy alone against the forts guarding the Straits. In mid-February an Admiralty memorandum declared a naval bombardment an unsound venture unless a strong military force was ready to assist in the operation. It was decided to make troops available to support the naval effort, if needed. The naval operations eventually came to a standstill. Operations against Turkey subsequently were conducted as a land campaign supported by the Navy’s guns. At dawn on April 25, 1915 a force of 75,000 Allied troops (British, French, Australian, and New Zealand) began landing on Turkish soil. On August 19, 1915, the Regiment left for Devonport embarking on the SS Megantic to join the British Middle East Force on Gallipoli. Their ship stopped at Malta, then went on to Mudros on the Aegean island of Lemnos. Unexpectedly, the ship was ordered to reverse course before unloading the Newfoundlanders. They continued sailing to Alexandria from Mudros where the men disembarked on September 1, 1915 and proceeded by train to Abbassia Barracks outside Cairo. After four days they moved to Polygon Camp, a tented camp in the desert. On September 13, 1915 the Regiment returned to Alexandria and boarded the SS Ausonia, arriving at Mudros on September 18, 1915. They immediately transferred to the Prince Abbas, bound for Suvla Bay and the 29th Division. Sept. 20, 1915, 0300 hrs: the Newfoundland Regiment arrived at Kangaroo Beach, Suvla Bay, Gallipoli, and joined the 88th Brigade of the 29th Division. On the day of arrival they were greeted by shelling from the Turkish batteries, resulting in fifteen wounded. Later that day they moved to the more protected shelter of Essex Gully. The first fatal casualty was Regimental # 902 Pte. Walter McWhirter killed in action on September 22, 1915. For the next week, the officers and men received instruction in trench warfare. On September 30, 1915 they took over the firing line in the centre of the Ninth Corps front. Front line duty continued ten days in the front line and ten days out of it. The distances from the front line to the rear areas were so small that no matter where you where, you were subjected to frequent shelling and sniper fire. Front line duty with relief in the rear areas continued during October and November, to the first half of December. During this time, there were casualties, but the main problem was sickness: dysentery, enteric and jaundice. More than half the men succumbed to illness before the left the Peninsula. On November 4, 1915 Captain Donnelly and a party of six men occupied a knoll in front of the Newfoundland line. This had been used by the Turks as a sniping post at nights. When the enemy came up to their usual position, they were met by the rifle of the Newfoundlanders. Additional Newfoundland reinforcements sent to the knoll met a Turkish patrol. The Turks were driven off by brisk rifle fire. The knoll was named Caribou Hill by the Regiment. For their part in this action, Captain Donnelly was awarded the Military Cross, Sgt. W.M. Green and Pte. R.E. Hynes received the Distinguished Conduct Medal and Lance Corporal F. Snow the Military Medal. There was a disastrous storm at the end of November. The trenches became rivers and collapsed, and the low lying areas by the beach flooded. On the night of November 28, 1915, the temperature dropped to below freezing with ice forming in the flooded water and in the trenches. Nearly 150 men of the Regiment went to hospital, mostly from frostbite. Lt. Col. A.L. Hadow assumed command of the Newfoundland Regiment on December 6, 1915. Orders to abandon the Gallipoli campaign had been prepared in mid-November. The evacuation had begun prior to the storm. The Newfoundland Regiment was part of the last rear guard to leave Suvla Bay on December 19, 1915. However, on December 22, 1915 the Regiment returned to the Gallipoli Peninsula. They landed at Cape Helles furnishing fatigue parties to the front line troops, then after December 30 1915 as stevedores on the beach loading supplies onto lighters. Lt. Owen Steele, with his men, were among the last to finally leave the Gallipoli Peninsula on the night of January 8/9, 1916. This rear guard action at Gallipoli has since been praised by military notables as a model for amphibious withdrawals. It was was a highly risky venture and succeeded beyond expectations. By early January the majority of the troops and equipment from the Dardanelles expedition were en route to a resting camp at Suez. Though the regiment was there to recuperate, life was not that easy for the soldiers. The Commanding Officer of the Regiment, Lieutenant Colonel Hadow, was a strict disciplinarian. He was determined to see that the Newfoundland Regiment achieved a standard of military efficiency equal to any other British regiment in the Division. Drills, exercises and route marches into the scorching desert became the order of the day. On 14 March, 1916, the Newfoundland Regiment boarded the troop ship Alaunia en route to France. Before the Regiment left the Gallipoli Peninsula, there were twenty-two killed, eight had died of wounds, and ten of disease. In addition to those that died, there were 80 soldiers of the Newfoundland Regiment that were wounded at Gallipoli. London Gazette, 23rd December 1915. ‘Action date, 4th/5th November 1915 - Caribou Hill, Gallipoli. ‘Action Date, 4th/5th November 1915 – Gallipoli. London Gazette, 19th February 1917. Following is a list of those buried at Gallipoli, in alphabetic order. (Future pages) You will notice that headstones are marked with a Cross and not the Regimental crest, as is done in France and Belgium.. The CWGC practice in other cemeteries was to display the soldier's regimental crest. Why this was different in Turkey probably lies in the post-war agreement between Turkey and the CWGC.